The survival rifle is a timeless classic in the rifle community and all throughout the world. Many versions of the survival rifle exist, from a specially designed rifle that a pilot might carry in his plane, to a 3 barreled rifle/shotgun combo that was carried by Cosmonauts, to an over-under rifle/shotgun combo, or just a simple 12 gauge shotgun with a couple extra accessories added to it. Survival rifles come in many configurations, numerous calibers, and from multiple manufacturers. Knowing what we do about Survival Rifles and the massive AR15 market, its probably no surprise that many survival upgrades/options are currently available for the M4 platform. The AR15/M4 is one of the most versatile Weapons Systems on the planet, but many of these upgrades that make it more of a survival rifle are not seen as such. With that in mind, we’re going to talk about survival rifles in general, but we’re also going to talk about how to “convert” the AR-15 into a survival rifle, what items need to be changed, upgraded, fixed, and so on. For a person looking to go deep into gun modification and building it might be worth investing in an 80 lower jig to make this easier and more cost effective. 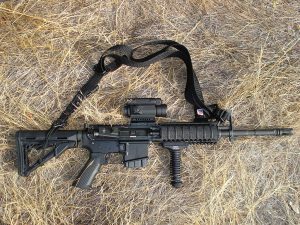 There are many things on the AR-15 that you have to change or replace if you want it to function more on the side of a ‘survival rifle’, as opposed to a combat or hunting rifle. You need to consider all of the furniture that’s on the rifle, the muzzle device that’s on the rifle, the Optics that are on the rifle, the ammunition you’re going to carry in the rifle, any kind of Sling system that you would have with the rifle, and a whole host of other things that go into the rifle should be part of the consideration you put in. You should also look at anything else that could be carried as an accessory to the rifle to aid in its new role. For example, if you have a Magpul MOE AR grip on your AR-15, those grips are hollow, and include an end cap that snaps into the bottom of them. Because of this, you can carry all sorts of smaller gear inside that grip. Multiple options are available, just from Magpul, but I prefer to stock the pistol grip with my own gear choices. So join us this next coming Thursday at 7 pm Pacific when we discuss Survival Rifles, and talk about how to convert your AR-15 into a survival platform… Without taking away from its current function. See you then. Previous: Previous post: Prepper Gift Guide!